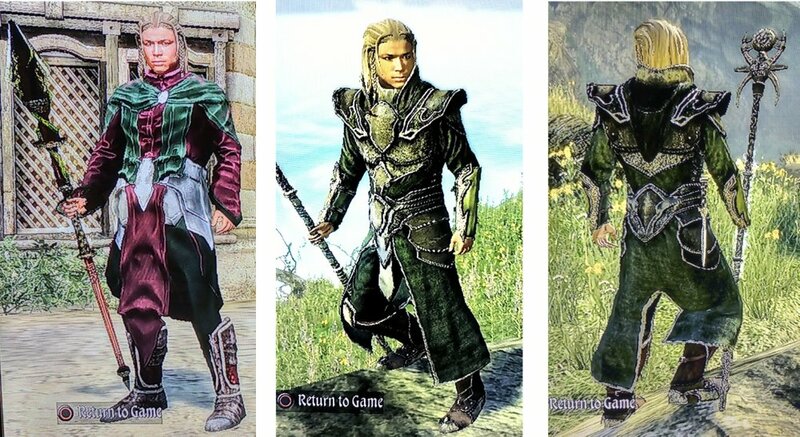 Mages appear in many fantasy worlds, and invariably they wear robes. Apparently, trousers squeeze and chafe. But robes drag on the floor and can impare movement! So, one fantasy world decided to break with tradition: their robes are really open-fronted coats, they come with leggings and don’t go all the way to the floor! – at least some of them. I am talking about Two Worlds II by Reality Pump (yes, it’s a video game). Ok, in reality it is probably just an artifact of computer modelling, but don’t spoil my fantasy here. 😉 Playing this character, I quite like how the jumpsuit robe follows his movements, and it does not look or feel the same like a proper robe, not even the short one. It looks like a really comfortable garment, actually, made of something stretchy, like sweatshirt material or boiled wool… I get the same feeling with the short robe: the skirt doesn’t move like coat tails but rather like an A-line skirt hugging he body but not sticking to it like a pencil skirt would. So how do you make it not flap about? You make it a proper skirt with a raised hem at the front, and that apron will distract your attention and make it look like it’s an open coat. 😊 Optical illusions all around. Yes, I know – I already have way too many projects going on. There’s the silk dress from the Shivering Isles, a four-piece 1930s saga from the German magazines (soon to be revealed! ), there’s another knitted dress with an Afghan skirt waiting to be sewn together, and a bunch of Steampunk garb for my other half, not counting the knitting – we are not mixing apples with pears here, – not counting tinkering projects (there’s also a Pfaff 230 added to that in the meantime), and certainly not counting any odd long-term embroidery projects with a typical running time of 10 years – but they all get finished eventually. So I really don’t need any new projects, and yet… ☺️ You guessed it – I ordered material for those two robes. Boiled wool for the short one (it’s already here and I want it done for this winter), and cotton sweatshirt material for the jumpsuit, because I think wool would be too hot, and besides I want it for the warmer time of year (this year!). I definitely need a time turner. I’ve already started drafting a pattern for the short robe – when something grabs you, you just have to follow it up. So watch this space for the rest of the adventure! Next Post Teal? Petrol? Turquoise?